To schedule a session (transformative dreamwork and/or equine guided learning), call me at 636-448-2522, or send me an email: kay_tomlinson@msn.com. Dreamwork sessions are held at my office in Maplewood, MO (or occasionally at the barn, where the horses can often help us in our understanding!) and last about an hour. The cost is $75. Yes! Many of my clients come to me on the recommendation of their psychologist. If you’re currently seeing a therapist, you may have her or him contact me directly to see if dreamwork or a session with the horses would be beneficial for you. If you are a therapist, give me a call. We can schedule a session for you to experience the horses yourself and talk about how this type of activity can help your patients. 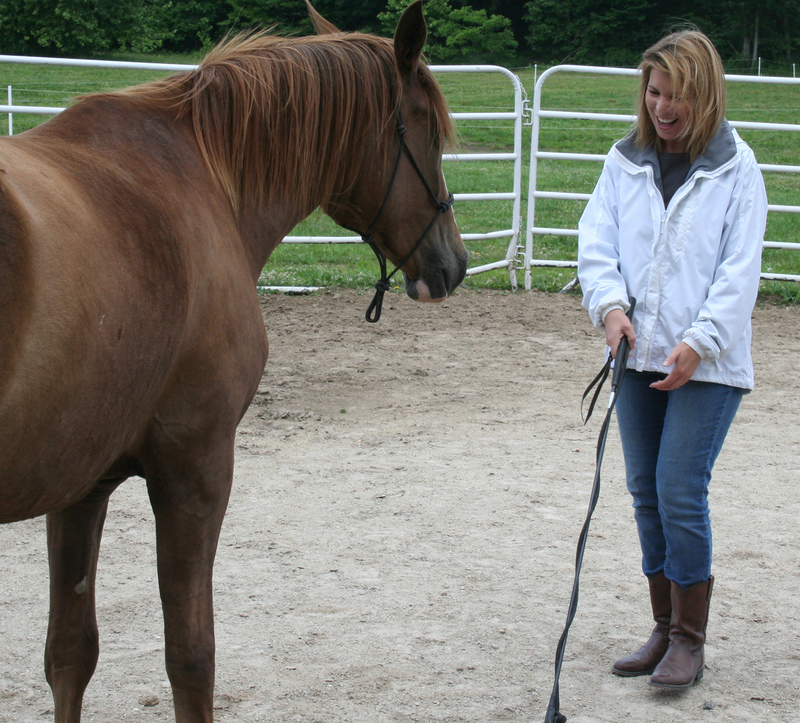 If we meet at the barn, your first session will include instruction in basic safety around horses. You’ll have a chance to get to know the horse, and vice versa, before any activities take place. We generally start with observation, grooming, and simple leading exercises to get you comfortable with the horse. 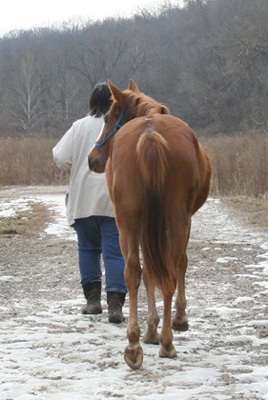 Depending on your needs, your interaction with the horses may include some instruction in natural horsemanship techniques, followed by work in the round pen (leadership training, for example). 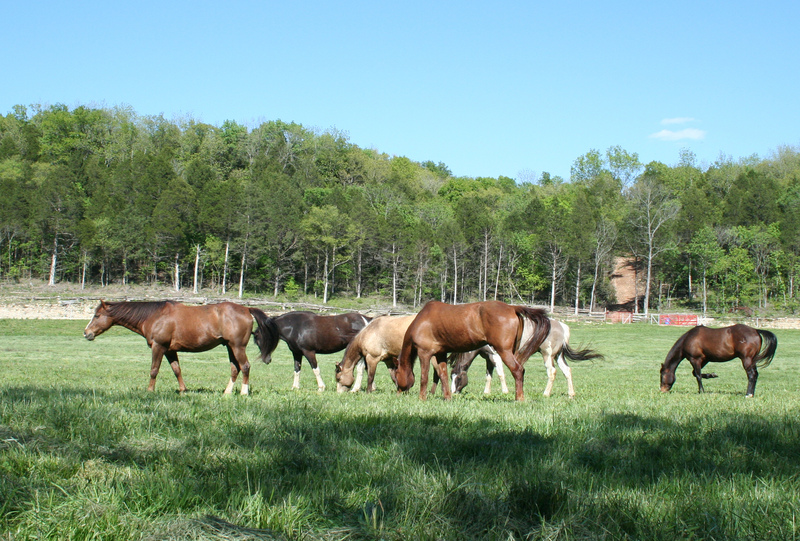 Often, reflective sessions with the horses take place in the pasture, arena, or round pen, with the horse either on or off lead. Your safety is always the biggest concern, and your comfort level with any interaction is taken into account. Sessions with the horses last from 1 to 2 hours, depending on the activity and your needs on a given day. We work on “horse time,” which means we don’t aim for the standard 50-minute “therapy” hour. Horses don’t wear watches! We work from a boarding facility in Fenton, MO. NOTE: All interactions with the horses are from the ground. There is no riding involved, so no prior experience is necessary. Also, appointments are weather-dependent! Above 90 degrees, below 25 degrees, or when there are storms, excessive wind, or icy roads, we may need to reschedule your appointment.